Best rates guarantee, since we are the owners. You Get Individual Service. We give you individual care whenever you need it, from the moment you book, your stay. We are not just a webpage booking machine, we are people who truly know and care about Crete. You are welcome to Crete, the birth place of Xenios Zeus. The god of hospitality. Welcome to Lasithi, the magical tapestry of splendid beaches, ancient treasures and landscapes. Welcome to Ierapetra, at the South-east of Crete. The southernmost town of Europe, with an average temperature of 20,1 °C, few rainfalls (average 440 mm of rain yearly) and a temperature that rarely dropping below 12 °C. The town with the greatest duration of sunshine, with an average of 3101 hours yearly. If you have ever dreamed of staying a while in a wonderfully restored traditional hotel in a real Cretan area - you have found it. So, welcome to our hotel! Some things haven´t changed. 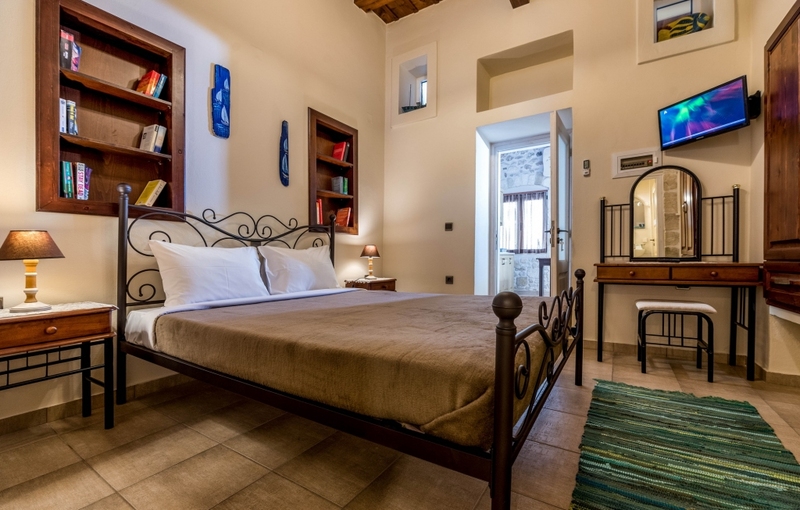 Cretan Villa is a charming small, family hotel, built in 18th century which still travels through the passing of the years. The house was first restored in 1970´s to a traditional settlement and since then it became the first hotel of the town. It hides a cool green garden surrounded by 9 traditional style comfortable rooms and a friendly atmosphere. It is located in a quiet pedestrian street, just a 1 minute walk from the town center and only 200 meters from the sea. In the surrounding area, visitors will find numerous stores, café, traditional taverns and restaurants. The town of Ierapetra is full of monuments and places of historical interest. Museums, fortifications, Byzantine walls, ecclesiastical monuments, Moslem monuments, synagogue, narrow streets in the old town and interesting buildings offer exciting hours of sightseeing. A stroll around the town can be combined with shopping and entertainment in taverns, cafes and bars, all just next to or at a very short distance from the Cretan Villa hotel. Our desk office provides any information and also, free internet access all day, rental cars service with special offers for our guests. Also organized cruise to fabulous national park of Chrissi island. Our philosophy in tourism is to treat our guests as we would like to be treated when we are on vacation. There is no greater satisfaction than having happy returning satisfied guests every year.